Carl Friedrich Gauss (Gauß) ( 30 April 1777 – 23 February 1855) was a German mathematician and scientist of profound genius who contributed significantly to many fields, including number theory, analysis, differential geometry, geodesy, magnetism, astronomy and optics. Sometimes known as "the prince of mathematicians" and "greatest mathematician since antiquity", Gauss had a remarkable influence in many fields of mathematics and science and is ranked as one of history's most influential mathematicians. Gauss was a child prodigy, of whom there are many anecdotes pertaining to his astounding precocity while a mere toddler, and made his first ground-breaking mathematical discoveries while still a teenager. He completed Disquisitiones Arithmeticae, his magnum opus, at the age of twenty-one (1798), though it would not be published until 1801. This work was fundamental in consolidating number theory as a discipline and has shaped the field to the present day. Gauss was born in Brunswick, in the Duchy of Brunswick-Lüneburg (now part of Lower Saxony, Germany), as the only son of uneducated lower-class parents. According to legend, his gifts became very apparent at the age of three when he corrected, in his head, an error his father had made on paper while calculating finances. The Duke of Brunswick awarded Gauss a fellowship to the Collegium Carolinum (now Technische Universität Braunschweig), which he attended from 1792 to 1795, and from there went on to the University of Göttingen from 1795 to 1798. While in college, Gauss independently rediscovered several important theorems; his breakthrough occurred in 1796 when he was able to show that any regular polygon with a number of sides which is a Fermat prime (and, consequently, those polygons with any number of sides which is the product of distinct Fermat primes and a power of 2) can be constructed by compass and straightedge. This was a major discovery in an important field of mathematics; construction problems had occupied mathematicians since the days of the Ancient Greeks. Gauss was so pleased by this result that he requested that a regular heptadecagon be inscribed on his tombstone. The stonemason declined, stating that the difficult construction would essentially look like a circle. 1796 was probably the most productive year for both Gauss and number theory. The construction of the heptadecagon was discovered on March 30. He invented modular arithmetic, greatly simplifying manipulations in number theory. He became the first to prove the quadratic reciprocity law on April 8. This remarkably general law (the previous discovery of which by Legendre in 1788 was unknown to Gauss) allows mathematicians to determine the solvability of any quadratic equation in modular arithmetic. The prime number theorem, conjectured on May 31, gives a good understanding of how the prime numbers are distributed among the integers. Gauss also discovered that every positive integer is representable as a sum of at most three triangular numbers on July 10 and then jotted down in his diary the famous words, " Heureka! num= Δ + Δ + Δ." On October 1 he published a result on the number of solutions of polynomials with coefficients in finite fields (this ultimately led to the Weil conjectures 150 years later). In his 1799 dissertation, A New Proof That Every Rational Integer Function of One Variable Can Be Resolved into Real Factors of the First or Second Degree, Gauss gave a proof of the fundamental theorem of algebra. This important theorem states that every polynomial over the complex numbers must have at least one root. Other mathematicians had tried to prove this before him, e.g. Jean le Rond d'Alembert. Gauss's dissertation contained a critique of d'Alembert's proof, but his own attempt would not be accepted owing to implicit use of the Jordan curve theorem. Gauss over his lifetime produced three more proofs, probably due in part to this rejection of his dissertation; his last proof in 1849 is generally considered rigorous by today's standard. His attempts clarified the concept of complex numbers considerably along the way. 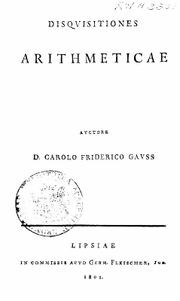 Gauss also made important contributions to number theory with his 1801 book Disquisitiones Arithmeticae, which contained a clean presentation of modular arithmetic and the first proof of the law of quadratic reciprocity. In that same year, Italian astronomer Giuseppe Piazzi discovered the planetoid Ceres, but could only watch it for a few days. Gauss predicted correctly the position at which it could be found again, and it was rediscovered by Franz Xaver von Zach on December 31, 1801 in Gotha, and one day later by Heinrich Olbers in Bremen. Zach noted that "without the intelligent work and calculations of Doctor Gauss we might not have found Ceres again." Though Gauss had up to this point been supported by the stipend from the Duke, he doubted the security of this arrangement, and also did not believe pure mathematics to be important enough to deserve support. Thus he sought a position in astronomy, and in 1807 was appointed Professor of Astronomy and Director of the astronomical observatory in Göttingen, a post he held for the remainder of his life. The discovery of Ceres by Piazzi on January 1, 1801 led Gauss to his work on a theory of the motion of planetoids disturbed by large planets, eventually published in 1809 under the name Theoria motus corporum coelestium in sectionibus conicis solem ambientum (theory of motion of the celestial bodies moving in conic sections around the sun). Piazzi had only been able to track Ceres for a couple of months, following it for three degrees across the night sky. Then it disappeared temporarily behind the glare of the Sun. Several months later, when Ceres should have reappeared, Piazzi couldn't locate it: the mathematical tools of the time weren't able to extrapolate a position from such a scant amount of data – three degrees represent less than 1% of the total orbit. Gauss, who was 23 at the time, heard about the problem and tackled it head-on. After three months of intense work, he predicted a position for Ceres in December 1801 – just about a year after its first sighting – and this turned out to be accurate within a half-degree. In the process, he so streamlined the cumbersome mathematics of 18th century orbital prediction that his work – published a few years later as Theory of Celestial Movement – remains a cornerstone of astronomical computation. It introduced the gaussian gravitational constant, and contained an influential treatment of the method of least squares, a procedure used in all sciences to this day to minimize the impact of measurement error. Gauss was able to prove the method in 1809 under the assumption of normally distributed errors (see Gauss-Markov theorem; see also Gaussian). The method had been described earlier by Adrien-Marie Legendre in 1805, but Gauss claimed that he had been using it since 1795. Gauss had been asked in the late 1810s to carry out a geodetic survey of the state of Hanover to link up with the existing Danish grid. Gauss was pleased to accept and took personal charge of the survey, making measurements during the day and reducing them at night, using his extraordinary mental capacity for calculations. He regularly wrote to Schumacher, Olbers and Bessel, reporting on his progress and discussing problems. As part of the survey, Gauss invented the heliotrope which worked by reflecting the Sun's rays using a set of mirrors and a small telescope. Gauss also claimed to have discovered the possibility of non-Euclidean geometries but never published it. This discovery was a major paradigm shift in mathematics, as it freed mathematicians from the mistaken belief that Euclid's axioms were the only way to make geometry consistent and non-contradictory. Research on these geometries led to, among other things, Einstein's theory of general relativity, which describes the universe as non-Euclidean. His friend Farkas (Wolfgang) Bolyai (with whom Gauss had sworn "brotherhood and the banner of truth" as a student) had tried in vain for many years to prove the parallel postulate from Euclid's other axioms of geometry. Bolyai's son, János Bolyai, discovered non-Euclidean geometry in 1829; his work was published in 1832. After seeing it, Gauss wrote to Farkas Bolyai: "To praise it would amount to praising myself. For the entire content of the work ... coincides almost exactly with my own meditations which have occupied my mind for the past thirty or thirty-five years." This unproved statement put a strain on his relationship with János Bolyai (who thought that Gauss was "stealing" his idea), but it is nowadays generally taken at face value. 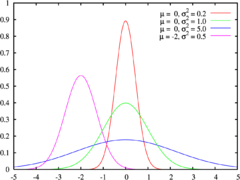 The survey of Hanover later led to the development of the Gaussian distribution, also known as the normal distribution, for describing measurement errors. Moreover, it fuelled Gauss's interest in differential geometry, a field of mathematics dealing with curves and surfaces. In this field, he came up with an important theorem, the theorema egregrium (remarkable theorem in Latin) establishing an important property of the notion of curvature. Informally, the theorem says that the curvature of a surface can be determined entirely by measuring angles and distances on the surface; that is, curvature does not depend on how the surface might be embedded in (3-dimensional) space. In 1831 Gauss developed a fruitful collaboration with the physics professor Wilhelm Weber; it led to new knowledge in the field of magnetism (including finding a representation for the unit of magnetism in terms of mass, length and time) and the discovery of Kirchhoff's circuit laws in electricity. Gauss and Weber constructed the first electromagnetic telegraph in 1833, which connected the observatory with the institute for physics in Göttingen. Gauss ordered a magnetic observatory to be built in the garden of the observatory and with Weber founded the magnetischer Verein ("magnetic club"), which supported measurements of earth's magnetic field in many regions of the world. He developed a method of measuring the horizontal intensity of the magnetic field which has been in use well into the second half of the 20th century and worked out the mathematical theory for separating the inner ( core and crust) and outer ( magnetospheric) sources of Earth's magnetic field. Gauss died in Göttingen, Hanover (now part of Lower Saxony, Germany) in 1855 and is interred in the cemetery Albanifriedhof there. Two individuals gave eulogies at his funeral, Gauss's son-in-law Heinrich Ewald, and Wolfgang Sartorius von Waltershausen, who was Gauss's close friend and biographer. His brain was preserved and was studied by Robert Wagner who found its weight to be 1,492 grams and the cerebral area equal to 219,588 square centimetres. There were also found highly developed convolutions, which in the early 20th century was suggested as the explanation of his genius (Dunnington, 1927). Gauss's personal life was overshadowed by the early death of his first wife, Johanna Osthoff, in 1809, soon followed by the death of one child, Louis. Gauss plunged into a depression from which he never fully recovered. He married again, to a friend of his first wife named Friederica Wilhelmine Waldeck (Minna), but this second marriage does not seem to have been very happy. When his second wife died in 1831 after a long illness, one of his daughters, Therese, took over the household and cared for Gauss until the end of his life. His mother lived in his house from 1817 until her death in 1839. Gauss had six children, three by each wife. With Johanna (1780–1809), his children were Joseph (1806–1873), Wilhelmina (1808–1846) and Louis (1809–1810). Of all of Gauss's children, Wilhelmina was said to have come closest to his talent, but she died young. With Minna Waldeck he also had three children: Eugene (1811–1896), Wilhelm (1813–1879) and Therese (1816–1864). Eugene immigrated to the United States about 1832 after a falling out with his father, eventually settling in St. Charles, Missouri, where he became a well respected member of the community. Wilhelm came to settle in Missouri somewhat later, starting as a farmer and later becoming wealthy in the shoe business in St. Louis. Therese kept house for Gauss until his death, after which she married. Another criticism of Gauss is that he did not support the younger mathematicians who followed him. He rarely, if ever, collaborated with other mathematicians and was considered aloof and austere by many. Though he did take in a few students, Gauss was known to dislike teaching (it is said that he attended only a single scientific conference, which was in Berlin in 1828). However, several of his students turned out to be influential mathematicians, among them Richard Dedekind, Bernhard Riemann, and Friedrich Bessel. Before she died, Sophie Germain was recommended by Gauss to receive her honorary degree. Gauss generally did not get along with his male relatives. His father had wanted him to follow in his footsteps, i.e., to become a mason. He was not supportive of Gauss's schooling in mathematics and science. Gauss was primarily supported by his mother in this effort. Likewise, he had conflicts with his sons, two of whom migrated to the United States. He did not want any of his sons to enter mathematics or science for "fear of sullying the family name". His conflict with Eugene was particularly bitter. Gauss wanted Eugene to become a lawyer, but Eugene wanted to study languages. They had an argument over a party Eugene held, which Gauss refused to pay for. The son left in anger and immigrated to the United States, where he was quite successful. It took many years for Eugene's success to counteract his reputation among Gauss's friends and colleagues. See, also the letter from Robert Gauss to Felix Klein on September 3, 1912. Unlike modern mathematicians, Gauss usually declined to present the intuition behind his often very elegant proofs--he preferred them to appear "out of thin air" and erased all traces of how he discovered them. Gauss was deeply religious and conservative. He supported monarchy and opposed Napoleon whom he saw as an outgrowth of revolution. The cgs unit for magnetic induction was named gauss in his honour. From 1989 until the end of 2001, his portrait and a normal distribution curve were featured on the German ten-mark banknote. Germany has issued three stamps honoring Gauss, as well. A stamp (no. 725), was issued in 1955 on the hundredth anniversary of his death; two other stamps, no. 1246 and 1811, were issued in 1977, the 200th anniversary of his birth. G. Waldo Dunnington was a lifelong student of Gauss. He wrote many articles, and a biography: Carl Frederick Gauss: Titan of Science. This book was reissued in 2003, after having been out of print for almost 50 years. In 2007, his bust is going to be introduced to the Walhalla. In Canadian junior high schools, an annual national mathematics competition administered by the Centre for Education in Mathematics and Computing is named in honour of Gauss.